Throughout history, the invention of a new technology has always spurred a new round of G&S recordings. 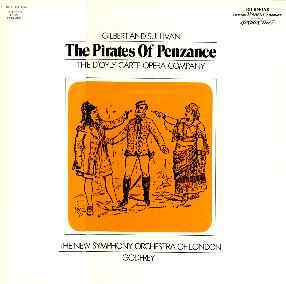 Thus it was that, when the stereo LP was introduced in the late 1950s, D'Oyly Carte embarked on a new traversal of the operas, even though the recordings the were replacing were less than a decade old. Sir Malcolm Sargent's competing series may have prompted Decca into action. 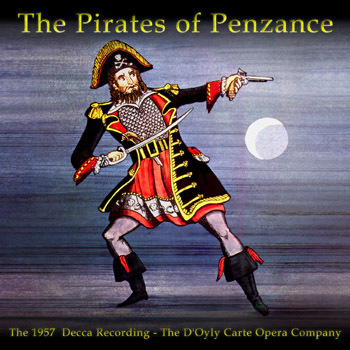 Decca's first two stereo G&S recordings came out at about the same time: The Mikado and The Pirates of Penzance, both recorded in late 1957, and issued in 1958. 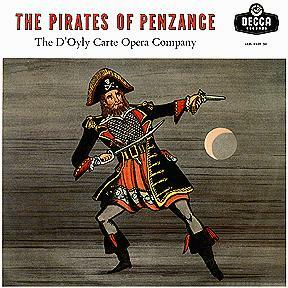 Both represented a high water mark in Decca's association with D'Oyly Carte. While the 1968 set, which has the complete dialogue, offers strong competition, this recording offers considerable merits of its own. Among them are Kenneth Sandford's Sergeant of Police (a role he gave up a few years later), Thomas Round's Frederic, and Jean Hindmarsh's Mabel. I don't think Peter Pratt matches John Reed in the role, but as one of the few documents of Pratt's art, the recording is nevertheless an important one. The 1957 Pirates is another top-belt recording with many of the same artists. Chris has certainly retained all the qualities mentioned with The Mikado. The orchestral detail is amazingly captured and the voices are nicely spread. The studio noises are still there in places but Chris has reduced these to a minimum. I found that the production did seem to drag with some quite sluggish tempos. The highlights must be the pairing of Thomas Round and Jean Hindmarsh as Frederic and Mabel. Their solos and duets are most delightful and its great to have them available on CD at long last. 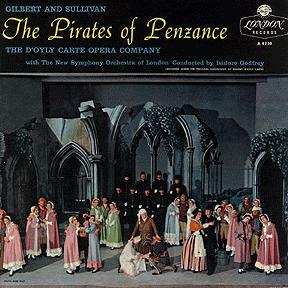 All of the early stereo recordings, including this one, were issued simulataneously on both mono and stereo LPs (until it became clear that the stereo sets would play just fine on mono equipment). After this recording was replaced, in 1968, it was re-issued on the budget Richmond label. Oddly, the Ace of Clubs label — Decca's equivalent to Richmond — issued the 1949 recording, not this one, the only place where Richmond and Ace of Clubs diverged. LKM 4249/50 The catalog numbers containing 'A' are Australian pressings. Those containing 'M' are New Zealand pressings. 1960s/70s Richmond Stereo LP SRS 62517 Some distributions of these two issues included a libretto with new cover art but the 1950 cast printed inside. The cast on the outside labels is correct.